The Villa il Noceto is a truly enchanting place where you can spend a relaxing holiday, immersed in the unique nature that serves as the setting for historic centres of rare and unique beauty. -Drive 17Km, where you will find the exit COLLE DI VAL D'ELSA-SUD/SANGIMIGNANO/VOLTERRA/STAGGIA. Exit the motorway. After approximately 100 meters, turn right (a sign indicates Colle di Val d'Elsa), continue another 100 meters and turn right again, continuing for about 1 km. -As indicated on the left you will find a sign showing the SS 541 for Follonica-Grosseto-Radicondoli: turn here. -Turn Right and after 50 meters turn to the left, following the signs for Radicondoli: you are now on the SS541. -Continue for 13 km, on your right you will find the sign indicating Radicondoli, SP 3 "delle Galleraie" turn here. -Continue for 15 km: on your left you will find the sign indicating Montalcinello-Chiusdino: turn here. -Continue for 7 km: after the sign at the entrance to the village of Montalcinello, there is an intersection (turning right you go to Chiusdino): go straight uphill until a fork. Take the road to the left, go uphill, you will reach the piazza del Paese; it is the one on the right, go slightly downhill, after 100/150 mt of asphalt and 200/300 mt of gravel road you will reach the farmhouse. -Straight after exiting the toll booth, turn right and take the SGC (motorway) to FLORENCE-SIENA. -Continue for 38 Km until the exit COLLE DI VAL D'ELSA-NORD/SAN GIMIGNANO/VOLTERRA. -This exit is recommended if you want to go through the village of Colle di Val d'Elsa for a stopover or a visit. -If you would rather avoid crossing the centre of the Colle di Val d'Elsa, you should not get out of the SGC exit C.V.E. - NORD, but continue 2.7 Km until the exit COLLE VAL D'ELSA-SUD, which is signed COLLE di VAL D'ELSA-SUD/SAN GIMIGNANO/VOLTERRA/STAGGIA. -Take the A-12 south (Pisa), up to VIAREGGIO. -From VIAREGGIO take the highway A-12 / A-11 from VIAREGGIO to LUCCA. -From LUCCA take the A-11 towards FLORENCE. -immediately after the toll booth at PRATO-EST, take the junction connecting the A-11/A-1, with signs for BOLOGNA / MILAN and ROME / NAPLES. -Head towards ROME and exit at FIRENZE-CERTOSA. -Take the A-1 for FLORENCE; after the toll booth at FIRENZE-NORD, continue South and exit at Firenze-Certosa. -Take The A-1 for FLORENCE-BOLOGNA-MILAN. -After the toll booth FIRENZE-SUD, continue in NORTH and exit at Firenze-Certosa. -On the motorway - from the airport follow the signs to the A/11 for FLORENCE. The motorway is faster moving than the S.G.C. 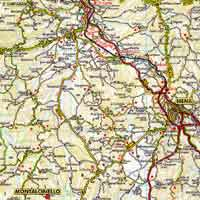 (super-motorway), but about 25 Km longer, as it takes a wider turn passing through LUCCA-MONTECATINI-FLORENCE-PISTOIA. -After about 90/95 Km, just after the exit of PRATO-EST, take the junction connecting the A-11/A-1, with signs for BOLOGNA / MILAN and ROME / NAPLES. -From the airport, turn right and take the SGC for FLORENCE. -After about 85 Km, almost at the entrance to FLORENCE, exit at SCANDICCI, where there are signs for BOLOGNA / MILAN and ROME / NAPLES. -After the SCANDICCI exit, at the end of a flyover, follow the signs to the exit FIRENZE-SIGNA (about 200 meters); at the exit there are signs for BOLOGNA / MILAN and ROME / NAPLES; head towards SOUTH ROME / NAPLES and exit at FIRENZE-CERTOSA. Do the rates include taxes? No, taxes are not included in the prices. The total bill including extra fees will be calculated at check-out. Do rates include heating, air conditioning and electricity? Prices include electricity and heating, but there is no air conditioning. Yes, dinners are available on request for a fee. Yes, there is ample parking. How many floors do the houses have and is there a lift? 2 floors but there is no lift. Are the apartments equipped with a TV? Are there international channels (satellite TV)? All apartments in Villa Il Noceto and Villa Montalcinello have satellite TV. Are the apartments equipped with direct dial telephone? Yes, and phone calls will be charged to the account to be paid at check-out. Can you connect the Internet? Internet connection is already possible at Villa Il Noceto and soon Villa Montalcinello will also offer this service. The nearest airports are Pisa, Florence and Rome about 100 kilometres. Do you have a transfer service to and from the airport? What is the nearest bus stop? 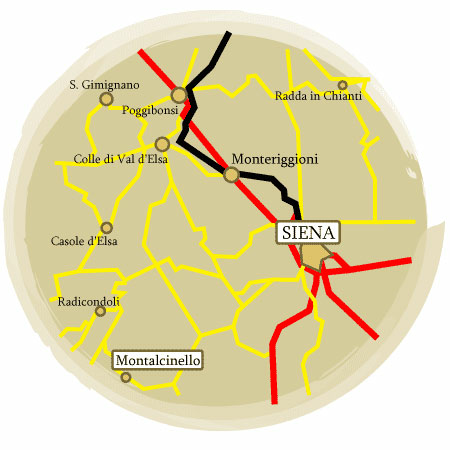 The nearest bus stop is in Montalcinello Siena and is the bus line that leads to all the neighbouring countries. 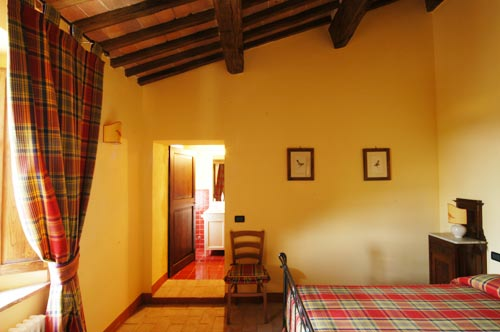 The nearest train station is Siena approximately 35 km from the property. Is there a spa on the property? Yes, there are two lovely pools. Sorry but pets are not allowed. Do you accept credit cards at Villa Il Noceto? No, we only accept payment in cash with a deposit of 50% by bank transfer at time of booking. Is there a restaurant on the property? No, but there are several restaurants in neighbouring villages or you can order typical Tuscan dishes by calling Maria Dora on 0577-79890 two days before. When booking we require a 50% deposit by bank transfer. This deposit will be retained if the customer fails to cancel the reservation within 30 days of the arrival date. 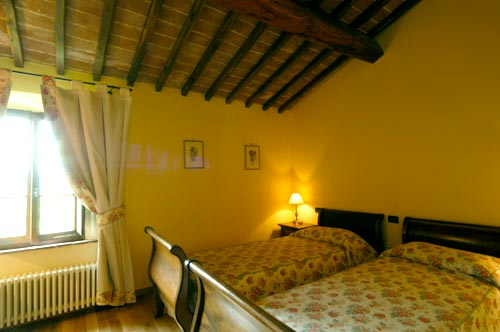 Villa il Noceto has 2 buildings immersed in the Tuscan countryside, where you can spend unforgettable days of comfort and relaxation.